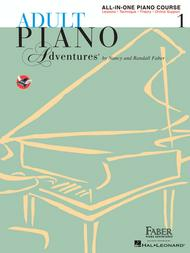 Adult Piano Adventures enables the adult beginner to play music for pleasure while developing musical understanding. This comprehensive All-In-One; book includes lessons, technique, and theory in a single volume for ease of use. Book 1 presents the fundamentals of music notation, chord playing, and musical form. The redesigned layout improves information hierarchy, putting focus on key concepts and step-by-step learning. Online support is now included, with over two hours of instructional videos and audio accompaniment tracks that inspire rhythmic vitality and artistic expression. Songs include: Amazing Grace • The Can-Can • Catch a Falling Star • Danny Boy • Eine Kleine Nachtmusik • The Entertainer • Greensleeves • The Lion Sleeps Tonight • and more! , the soundtracks are also downloadable as midi files for people with digital keyboards or pianos. All in all, a complete package, I highly recommend it. of what you learned from the previous unit lessons quite well. 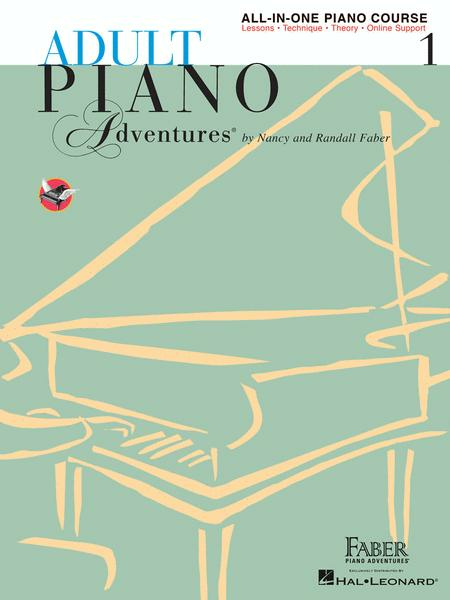 This is the first time I have purchased a piano course book. I would recommend this to anyone willing to put the time and effort into learning piano. It is always a good feeling to know that you are growing as a pianist each time you complete a unit. It is definitely a good investment. I love this book. Two students that I have working in these books really like the songs, duets, and the pace. Good book. Easy-to-use, comprehensive, fast paced course to use with adult beginners. Outstanding book and great value for your money. I have even used this with an older beginner (child). Compiling the technique, lesson and performance songs creates a very ideal method in pace, variety and time required to practice. Highly recommended for older children, teens and adults. 32 of 52 people found this review helpful.